This 10-page PDF package contains some interesting, even amusing information. There is a lengthy article about how the initial wave of visitors from outside Indianapolis had arrived and were filling up hotels. Undeniably the most interesting article discusses how 27-year-old Bob Burman's astrological stars were in alignment for him to win the first Indianapolis 500. This is supported by an interesting image which is in decent shape for a photocopy scan from an old newspaper. 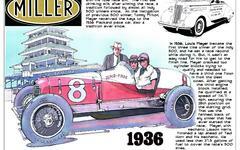 This article was published the day before the first Indianapolis 500 in the May 29, 1911 Indianapolis Star.